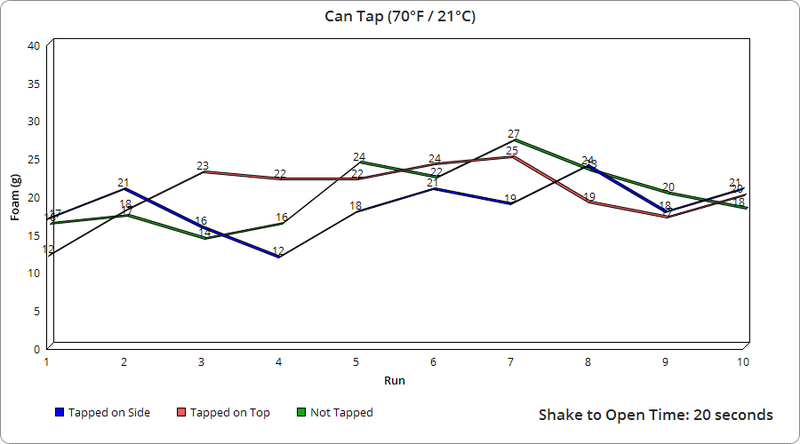 Does Tapping on a Shaken Soda Can Actually Reduce Fizz? 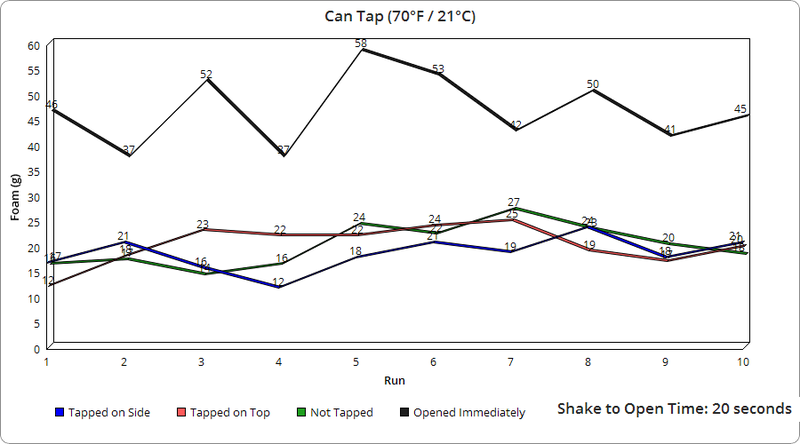 Michael P. asks: Does tapping on the top of a shaken pop can really prevent it from fizzing up? For the uninitiated, it’s commonly held that when opening a recently shaken can of soda, you can avoid, or at least reduce, the inevitable shower of sugary carbonated liquid by simply tapping the top or side of the can briskly with your finger a couple dozen times. So does tapping the can actually do anything? Well, we looked far and wide for a definitive answer to this question and came up empty, so decided to run an experiment ourselves to find out the answer. Now, to be clear, certainly there are many otherwise reputable sources throwing out an opinion on this one on both sides of the argument, but, outside of Snopes, nobody seems to have bothered to experimentally test whether tapping the can does anything. And as for Snopes, while they technically did do an experiment, this was a reported sample-size of just three runs (although they do allude to “a variety of experiments” not reported). It is possible one doesn’t need a large sample size here to get meaningful results, so perhaps three runs is a perfectly sufficient sample. However, Snopes gives no hard quantitative data (only anecdotal observations) on this one, and did not necessarily shake each of the cans the exact same way (though did time it and presumably the shaking was approximately the same if they had the same person shaking each time). But needless to say, while Snopes’ conclusion may end up being perfectly correct, we weren’t really comfortable stating it as a definitive answer here given the way the experiment was conducted and lack of hard data. But if you’re curious, their results indicated that tapping the side of the can produced slightly less foam than simply waiting to open it, but otherwise from a practical standpoint didn’t really make a difference. Despite this, many otherwise reputable sources claim that tapping the can does actually help. Why? As you’re probably aware, when you shake the can, the agitation causes some of the dissolved carbon dioxide in the container to form bubbles at various nucleation sites on the inner surface. It’s also further widely held that some of the bubbles formed will stick to the inside of the container at these various nucleation sites, rather than rising to the top. When the can is opened and the high pressure thus released, these bubbles rapidly expand and shoot to the top of the container, pushing out some of the liquid they were surrounded with previously with them. Thus, the hypothesis is that by tapping on the can, you can dislodge these bubbles and cause them to float to the top before opening the container, so that when you do open the can, the gas can expand and escape without taking any liquid with it. So does this actually work? To begin with in our little experiment, we needed a device that could shake our soda cans exactly the same every single time. The Shakenator T-3000 we made to do this works such that with each button press, it shakes the can exactly 10 times with a stroke length of 1.125 inches or 2.9 cm. 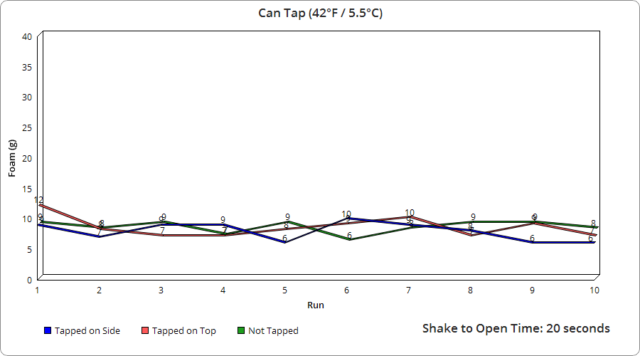 Through a bit of experimentation, we ultimately found that at our coldest measured temperatures about 150 shakes (at about 8.8 complete shakes per second) was around the point where we started getting very good, measurable results with Coke cans, so went with that for the number shakes. Because temperature is a big factor in how much foam is produced, the device also reports the temperature after each run, along with the number of shakes and the time it took for the run to complete. Now to the experiment. 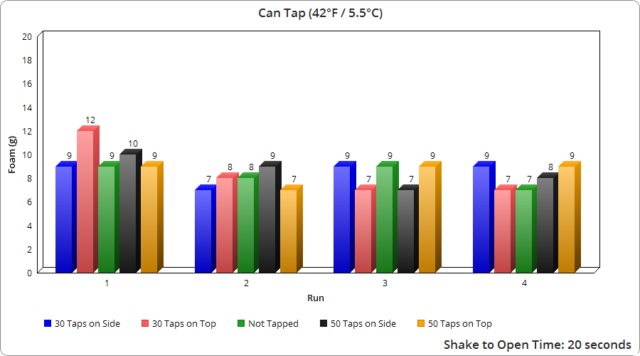 There are a variety of ways we could have done this, but as we’re far more interested in the amount of foam coming out, rather than the amount of carbon dioxide, we’re choosing to measure the liquid that comes out of a can, glass bottle, and plastic bottle when the respective containers are: shaken and then tapped on the side, shaken and then tapped on the top, shaken but not tapped- simply waiting the same time interval as if we tapped it, and then shaken, and quickly opened upon removal from the machine. This latter one is particularly of interest as one alternate hypothesis often put forth on why tapping the can does increase your odds of avoiding a fizzy bath has nothing to do with the tapping itself, but is because people tapping the can wait a short interval before opening it, giving some of the carbon dioxide time to re-dissolve into the liquid and any formed bubbles to rise to the top where they won’t push any liquid out. Also, just because we were curious, we ran an additional experiment shaking several cans and then opening them at intervals to see how long it would take for no more liquid to be pushed out. Obviously the results here will vary for other shaking scenarios based on a variety of factors, but we were really just curious at about broad ballpark numbers here. So what were our results? Well, it turns out that the actual tapping of the can does nothing. However, we were very surprised to note that the seemingly insignificant time interval here of 20 seconds from shaking to open actually did make a huge difference in the amount of foam produced. 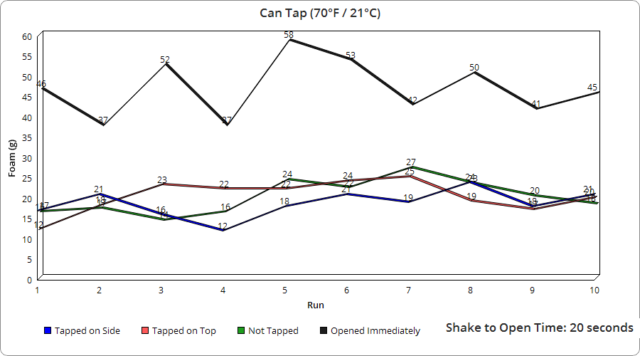 And, in fact, on the runs when we opened the can as fast as possible after being shaken, even just a change of a few seconds appears to have made a big difference in foam output, as you’ll see from the results which show that that portion, which was the only one not precisely timed, is the only place we really saw a large variance in resulting foam, even though every open in that case was within a few seconds of each other. As for the rest of the subtle variance in other runs, it was interesting to observe how even the tiniest change in the opening speed of the containers, which results in the pressure being released at different rates, made a very measurable difference in the foam produced to the point where I was eventually able to roughly predict the foam output based on how I judged my opening speed, despite the fact that in all cases with the can and glass bottles, it only took a fraction of a second to open them completely. Specifically, using video footage of a dozen openings on each, we measured an average of 0.07 seconds to fully open the glass bottles and 0.22 seconds for the cans. With the plastic bottles, this was likewise very similarly timed each time, though took on average about 1.91 seconds to fully twist the cap off, with the slightly wider variance there resulting in a bit larger range in output foam. As for tapping in the air vs. on a hard surface, it would seem this did not have a noticeable effect either way. And because it actually takes quite a bit of shaking to get a measurable amount of foam spillage (using a gram as the smallest increment- for reference here the containers in question contained roughly 340 grams of liquid), we’re guessing in real world scenarios where people are trying to reduce foam by tapping, nobody’s tapping the can vigorously enough to make a noticeable difference in foam output. It’s also noteworthy that whether tapping 30 times or 50 made no real difference here in terms of the expected outcome. Another interesting point is that the plastic bottles produced significantly more foam, despite it taking much longer to fully open them. As previously mentioned, based on our observations with all container types, even a fraction of a second change in opening speed made a noticeable difference in foam output. And given it took roughly 13 times longer to open the plastic containers fully compared to the average of the glass and cans, one might have initially expected the plastic containers would produce much less foam as a result, not more. Given how much carbon dioxide is added significantly affects the taste of the beverage, we’re presuming Coca-Cola does not vary the initial carbonation level added based on container type. If that’s correct, we’re guessing that the plastic containers must contain a much greater number of nucleation sites than glass or aluminum, ultimately producing many more bubbles for the same shakes. This brings us to how long we had to wait until no foam was produced. We initially expected we’d have to go out to intervals of maybe even as much as an hour to see the foam completely disappear, but we were woefully incorrect on this point. In fact, our first experimental run of just 60 seconds of waiting ended up producing no foam whatsoever despite the 150 vigorous shakes and the small geyser produced at a few second interval given those shakes. We then broke it down to 10 second intervals and found at the colder temperature it took just 50 seconds for foaming out of the container to no longer occur and at 40 seconds, while there was a slight overflow onto the lid area, it was not even a gram’s worth and certainly didn’t naturally spill off the container. 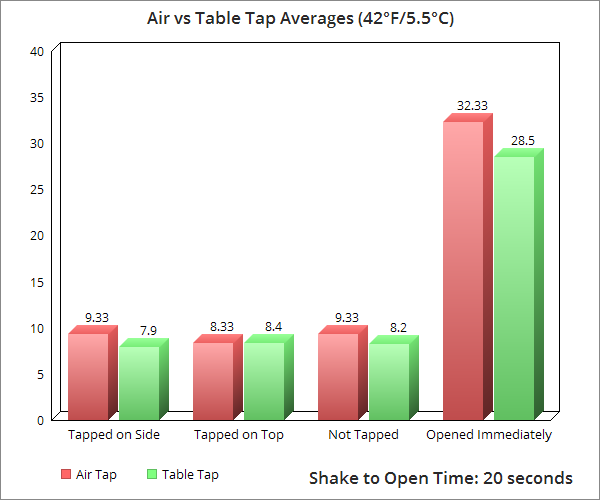 At the higher room temperature, the results were surprisingly similar at 40 seconds producing just slightly more foam than at the 40 second mark in the colder temperature, more or less mimicking the 30 second run at the colder temperature. Similarly, the 50 and 60 second marks at room temperature mimicked the 40 and 50 second marks respectively at the near refrigeration temperature. As to why there is so little foam being produced after such a short interval, it would seem to us there are two possibilities, both of which may be coming into play. The first possibility is that the carbon dioxide is rapidly being redissolved in the liquid. But as we didn’t measure the actual escaped C02 compared to an unshaken container, we can’t say for certain to what extent that is happening. The second possibility is simply that all the bubbles created from the shaking rise to the top in this time span and, with no further shaking causing more bubbles to form at the nucleation sites, the undissolved carbon dioxide is simply escaping when you open the can without pushing out any liquid. Supporting the idea that this is the bigger factor in this case is footage of the shaken glass and plastic bottles which show a dramatic drop-off in created bobbles in a relatively short time span after shaking is stopped, with those created all rising to the top relatively quickly and no visible bubbles clinging to the sides as if often claimed happens when people talk about the supposed benefits of tapping the container. Further, while we didn’t measure the carbon dioxide output, for what it’s worth, observationally even when no significant foam was produced, there still sounded like a lot more gas escaping when opening these shaken cans compared to opening cans that had just been sitting around, which we did several times just to compare the sound back to back. Though, of course, further experimentation measuring the actual carbon dioxide output would need to be done to know for sure. So there you have it. 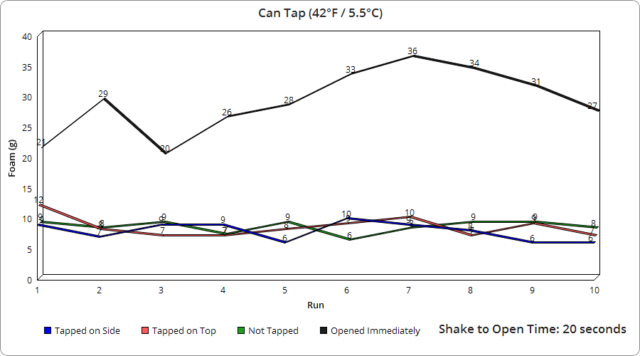 We now know for certain that tapping a can of soda does absolutely nothing to reduce foam and it is actually the short time interval taken to tap the can that is reducing foaming vs. simply opening the can immediately. It also very much appears that tapping the can vigorously, which while potentially could have produced more foam via further agitation, did not produce any practical increase in fizz. And while your results will vary based on things like temperature, atmospheric pressure, and how much a given can was shaken, it would very much appear in all cases you really don’t need to wait more than around a minute or so for things to stabilize in the can to the point where you can safely open the soda container without risk of a foam over, even if you open the container quickly. Why Do Mentos and Diet Coke React? Why Do Cans of Diet Coke Float But Cans of Regular Coke Don’t? What Happens When You Freeze Water in a Container So Strong the Water Can’t Expand Into Ice? Just for fun, we also ran this experiment on cans of Dr. Pepper to see if the results changed at all. They did not in terms of the main points already made. However, what was interesting to note was that the Dr. Pepper produced about half as much foam on average as the Coca-Cola for each of the scenarios. There are a variety of potential ingredients that can cause a difference here. For instance, with many diet sodas that contain aspartame, they end up producing more foam because aspartame lowers the surface tension of the liquid much more than sugar or corn syrup will. It’s possible Coca-Cola simply contains more surfactants than Dr. Pepper. Or it’s possible Dr. Pepper just contains much less carbon dioxide than Coca-Cola; given the amount of carbon dioxide dissolved in the beverage greatly influences the taste and mouth feel, we’re presuming there is a reasonable variance from flavor to flavor. And, anecdotally, it does always seem like Dr. Pepper goes flat much faster than Coke…. But that’s an experiment for another day. For now, at least, we thought it was interesting to note how much less foam an equally shaken can of Dr. Pepper produces compared to a can of Coke. While you might think the title of “foam expert” we previously mentioned is some sort of exaggeration, it turns out this was yet another career path that your high school guidance counselor didn’t tell you about. The aforementioned Professor Siebert is one of the world’s leading experts in beverage foam and fizz and is even cited as the discoverer of the compound that creates “optimal beer foam” in a 2014 study. He also reportedly worked for many years in the beer industry studying the microbiology of various drinks, including how to create optimal foam. Professor Siebert has also written at length on the topic of foam in beverages and its relation to sensory enjoyment of drink. As alluded to, virtually all fizzy drinks on the market today are made that way using carbon dioxide, which is dissolved into whatever liquid the can contains via both cooling the liquid, which allows more CO2 to be dissolved in than would be possible at warmer temperatures, and introducing the C02 in a highly pressurized environment. For reference, according to a representative from the Pepsi Brooklyn Bottling Center, “At 60°F, the gauge pressure in the container is approximately 40 psi” (276 kPa). For another reference, a can of 7UP at approximately 40°F / 4.4°C has an internal pressure of about 30 psi or 207 kPa. And, according to one Jeff Sowell, a Consumer Affairs Specialist at Coca-Cola, a typical can of Coca-Cola has an internal pressure of about 55 psi or 380 kPa at 75°F / 23.9°C. 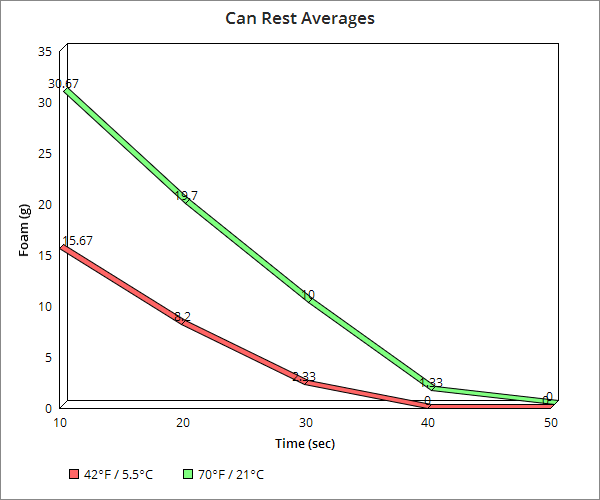 It would appear that, on average, most soda cans tend to have a pressure of roughly 120 kPa at 4°C and about 250 kPa at about 20°C. If you’re wondering at this point why they put C02 in so many soft drinks, this is for the significant effect the formed carbonic acid has on the flavor, helping to reduce the ultra-sweet taste of the drink, as well as changing the mouthfeel somewhat. This is why when you drink flat soda it tends to have an extremely sickly sweet taste. Specifically, the carbonic acid is primarily detected via your sour-sensing taste cells. And, in fact, people who take altitude-sickness drugs that block the carbonic anhydrase enzyme on your taste cells end up reporting that carbonated beverages taste significantly different when on those drugs. Does Tapping a Soda Can Prevent it from Foaming Over? Does Tapping a Soda Can Stop the Foaming? Why Do People Tap on Cans? How Much Pressure Can a Two Liter Bottle Handle? Why Do People Tap on Soda Cans Before Opening Them? 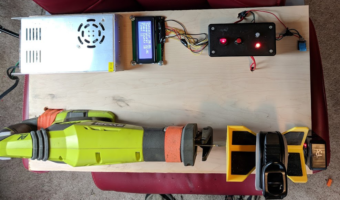 Does Tapping a Can Really Do Anything? Does Tapping a Can Really Work? Why Do Soft Drinks Go Flat? Interesting. My experience with beer cans is that if I drop one before opening it and thus fear a foam explosion, I find if I BANG the can on a table or other hard surface and then open it slowly I get no problem with foaming. So far I would say I am batting 100% success on this over several years and maybe a dozen cans. My emphasis above on “BANG” is what I suspect is key. I do not “tap” the can but bring it down hard enough to dent it. Maybe I have it all wrong but, as I said, has worked for me thus far. The major flaw I see in the linked demonstration is that Spangler doesnt show a reference can which he shakes but doesnt tap. So he technically never shows a decrease in spillage since he only anecdotally refers to unspecified ‘cans exploding’ and doesnt show how much a shaken can of salzer water actually fuzzes after just waiting a few seconds. Never heard of this technic. I use the one were you set aside thirty minutes or so. Why did you take down the video for this article? For all the work you guys put into it I’m surprised that you only left it up for two days. Just curious. I love this. Quick question though. I have sometimes opened a can of soda after falling through a vending machine and the foam spilled out enough to wet my hand. This seems to indicate that the physics of shaking and the physics of “dropping” a can results in a different amount of bubbles being produced. Alternatively, shaking a can usually involves the liquid moving top to bottom as we mostly shake cans in a fairly upright position. Whereas dropping a can involves the can landing on its side. Giving that bubbles at the top of the can produce no foam perhaps slamming the liquid into the side of the can when dropped causes foam spill with less shaking because all the bubbles are positioned on the side of can still if you open right away. I don’t care what anyone says, I have always tapped the top of a can when it’s been shook up and have NEVER had it blow up on me!!! Is this article for real? Shakenator T-3000? Just drop the bottle or can from the same height each test. Thats more like real life experience than a “Shakenator”. I hope anyone that believes this article buys a soda on a warm day when they’re thirsty and drop that soda on the ground right before they’re about to drink it haha. That’ll be a fun lesson learned(Dont abandon logic just because some dummies that did a half assed experiment say so).